Despite my Irish heritage, I have not done anything to celebrate Saint Patrick’s Day in recent years. Now that cooking has become a hobby, I thought it would be fun to create an Irish-inspired meal. On Sunday, my mother and I made Potato Leek Soup and Brown Irish Soda Bread for our early Saint Patrick’s Day celebration. I tried Potato Leek Soup for the first time at Epcot’s International Food and Wine Festival last fall. For some reason, I always shied away from leeks. I used to be a very picky eater, and I sometimes still avoid foods for no good reason. I’m glad I finally tried the soup! Since I love potatoes in just about any form and have quite a weakness for cream soups, this is a perfect soup. At the same time, I also sampled some Brown Soda Bread and Dubliner cheese. I found this recipe for Potato Leek Soup in the Boston Globe. 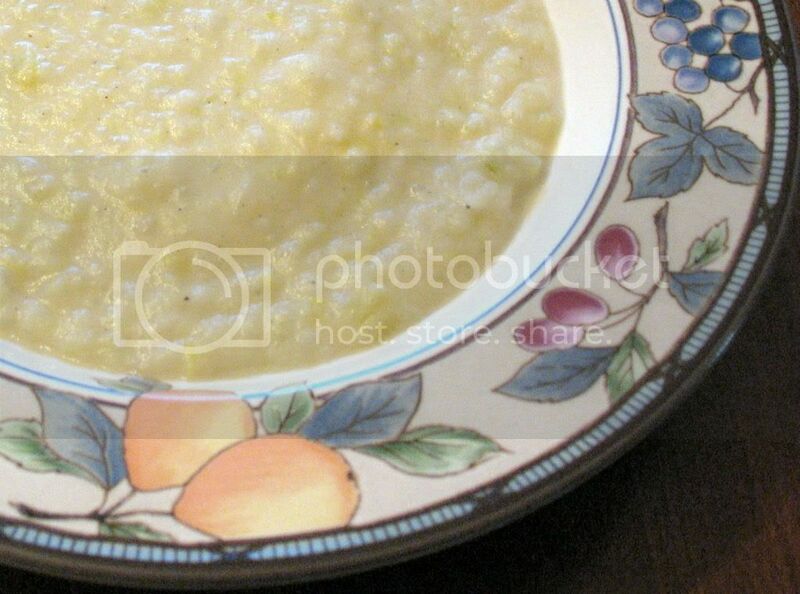 It appeared to be straightforward and was very similar to other Potato Leek Soup recipes I had found online. Since soup is always better when served with bread, I also made Brown Irish Soda bread. I followed the recipe pretty closely, but omitted the parsley and added some dried rosemary. I started with 1/4 tsp, but added more as I altered the seasoning to fit my tastes. To speed up the cooking process, I cooked the potatoes at a low boil before mashing with a potato masher. Once the soup was done, I added an extra 1/4 cup of broth and 1/4 cup of cream. It’s worth noting that I think milk or half and half would work quite well in this soup in place of the heavy cream. According to the Globe, this recipe produces 6 servings, but I got 8 1+ cup servings. The soup was delicious! I just finished the last of the leftovers, and were sad to see them go! 1. In a large heavy-based stock pot, melt the butter over medium heat. Add the onions, leeks, and garlic. Cook, stirring often, for 10 minutes or until softened. 2. Add the potatoes, 4 cups of the stock, salt, and pepper. Bring to a boil. Lower the heat and simmer about 15 minutes or until the potatoes are tender. 3. Either mash the potatoes with a potato masher or, puree soup in batches in a blender. Return it to pot. Bring to a simmer. Add the cream and parsley, and taste for seasoning. Add more salt and pepper, if you like. If the soup is too thick, add remaining stock in 1/4-cup increments until it is the consistency you prefer.